It has shaken conventional media, has had its Italian premiere banned amid huge controversy, has provoked anger and tears among two million Italian viewers, it has been discussed in more than 50 independently organized debates around the world, and has opened the public’s eyes to the full nature of Italy’s political, economic and above all moral malaise. Directed by Italian film-maker Annalisa Piras and narrated by former Economist chief editor Bill Emmott, the ailments of Italy are laid bare in Girlfriend in a Coma with clarity, creativity and humour—never seen before. Those ailments, of corruption, political dysfunction, economic stagnation, declining rule of law and above all a failure of moral courage, are ailments shared increasingly by all western countries. Girlfriend in a Coma acts as a warning and a wake-up call, for all of us. 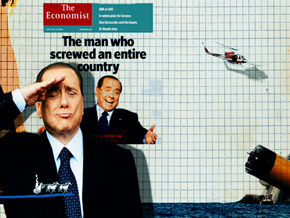 The film has been updated to take account of the criminal conviction in August 2013 of its three-time prime minister, Silvio “Bunga-Bunga” Berlusconi for tax fraud, and of the changes in Rome both of prime ministers and of popes. As recent events have shown, the waves from Italy’s political struggles are being felt all over Europe, and those of Europe all over the world. Are Financial Markets Going Crazy?